This report examines the opportunities for American businesses and investors in a clean energy economy. It presents technology choices and outlines near- and medium-term investment opportunities across nine U.S. census regions. It finds that lowering climate risk by building a clean energy economy is technically and economically achievable using commercial or near-commercial technology. In our 2014 inaugural report, “Risky Business: The Economic Risks of Climate Change in the United States,” we found that the economic risks from unmitigated climate change to American businesses and long-term investors are large and unacceptable. Subsequent scientific data and analysis have reinforced and strengthened that conclusion. As a result, we, the Co-Chairs and Risk Committee of the Risky Business Project, are united in recognizing the need to respond to the risk climate change poses to the American economy. Now we turn to the obvious next question: how to respond to those risks. Seriously addressing climate change requires reducing greenhouse gas emissions by at least 80 percent by 2050 in the U.S. and across all major economies. We find that this goal is technically and economically achievable using commercial or near-commercial technology. Most important, we find that meeting the goal does not require an energy miracle or unprecedented spending. The transition to a cleaner energy economy rests on three pillars: moving from fossil fuels to electricity wherever possible, generating electricity with low or zero carbon emissions, and using energy much more efficiently. This means building new sources of zero- and low-carbon energy, including wind, solar, and nuclear; electrifying vehicles, heating systems, and many other products and processes; and investing in making buildings, appliances, and manufacturing more energy efficient. Meeting these targets requires a large-scale shift away from ongoing spending on fossil fuels and toward up-front capital investments in clean energy technologies. Many of those, such as wind and solar, have little or no fuel cost once built. Given an appropriate policy framework, we expect these investments to be made largely by the private sector and consumers, and to yield significant returns. Because of the large capital investments and the long-term savings in fuel costs, this shift presents significant opportunities for many American investors and businesses. Notably, shifting the U.S. to a low-carbon, clean energy system presents not just long term benefits but also immediate, near-term opportunities, particularly for those actors best positioned to capitalize on these trends. Generate electricity from a relatively even mix of these three zero- and low-carbon resources (the Mixed Resources pathway). Each pathway also assumes a different combination of transportation fuels (electricity, biofuels, and fossil fuels). For each of these pathways, we modeled changes in nationwide and sectoral energy use, electricity use, fuel use, carbon emissions, and investment. We do not endorse any specific pathway. Figure ES-1 depicts the annual changes (from reference case levels) in investments and fuel expenditures averaged over three decadal periods for the Mixed Resources pathway. We modeled four distinct pathways that could achieve economy-wide reductions in CO2 emissions of 80 percent below 1990 levels, and compare results to a “business-as-usual” pathway we call the High-Carbon Reference Case. Three of these pathways each rely significantly on one of the three major types of low- and zero-carbon electricity: renewable energy, nuclear power, and fossil fuel power with carbon capture and storage (CCS). The fourth, labeled the “Mixed Resources” pathway, relies on a balanced blend of these three types of clean electricity. The Co-Chairs and the Risk Committee of the Risky Business Project do not endorse any one specific pathway. Explore the interactive figure below to see specifically how each of the four different pathways differ in terms of levelised costs and emissions. 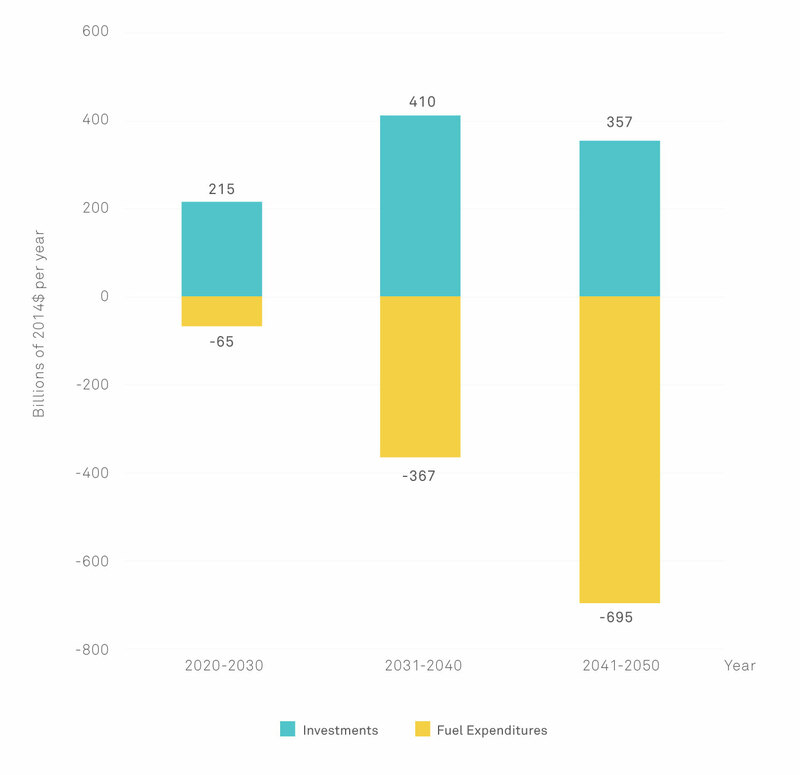 The largest additional investments would be in power generation ($55 billion per year); advanced biofuels ($45 billion per year); purchases of advanced light duty vehicles ($75 billion per year); and energy efficiency measures ($16 billion per year). Businesses that become leaders in these sectors could see large increases in revenue in the years ahead, while those that lag behind risk being left with stranded assets. The investment needs of a transition to a clean energy economy are manageable, especially when compared to the costs that would be imposed by unmitigated climate change and continued fossil fuel dependence. They are also comparable to other recent investments, such as in unconventional oil and gas production, and in computers and software. Those investments have transformed the American economy, yielding huge returns to those businesses that led in the development of new technologies and products. Investment needs and business opportunities will vary considerably by region. For example, in our Mixed Resources pathway, new nuclear plants would likely be built in the mid-Atlantic and southern regions, while wind power would grow fastest in the windy central region, investments in solar power would be greatest in the sunny western and southern regions, and revenue from biomass feedstocks would be greatest in the Midwest. Overall, the increased investment would boost manufacturing and construction across the U.S. Roughly 460,000 additional construction jobs could be created by 2030, with the number rising to 800,000 by 2050. At the same time, reductions in fossil fuel use would further constrain coal, oil, and natural gas exploration and production. The number of coal mining and oil- and gas-related jobs could decline by more than 130,000 by 2030 and 270,000 by 2050, disproportionately affecting the specific geographic regions that currently depend heavily on these industries. We know innovation will continue as American businesses develop and deploy new technologies. Many economic sectors and communities will also respond to the challenges and opportunities presented by the transition to a clean energy economy in new and surprising ways. We can project how the costs of current technologies are likely to decline as they are developed and deployed, but we can’t predict which new technologies will emerge in the next 35 years—though we’re confident new innovations will be made. The costs of creating a clean energy economy are thus likely to be lower—and the benefits greater—than we project. The private sector alone cannot solve the climate change problem. We know from our collective business and investment experience that the private sector will take action at the necessary speed and scale only if it is given a clear and consistent policy and regulatory framework. That framework must send a clear, consistent, and long-term market signal on the necessity of climate action, provide incentives for innovation and deployment of clean energy systems, and help society adapt to climate impacts that are inevitable due to past and current emissions. We are united in believing that the real costs of carbon emissions must be incorporated into economic decision-making in both the public and private sector, for instance, through putting a price on carbon. Government investment must also be coordinated and streamlined—and must not subsidize or exacerbate climate-related risks and economic activities that contribute to climate change (e.g., tax incentives for fossil fuel extraction or subsidized flood insurance in high-risk areas). Policies should also help those Americans hurt by the clean energy transition, as well as those who are most vulnerable to climate impacts. America has a responsibility to lead by example. Ultimately, however, U.S. actions must be integrated into a larger global commitment to shift toward a cleaner energy economy. U.S. policies also must ensure that the competitiveness of U.S. business is not harmed. This may require border adjustments and other mechanisms to prevent other countries from seizing unfair advantages. With the right policy framework, we are confident that America can reduce the economic risks from climate change while seizing new market opportunities. But businesses must also start now to factor climate risks into their investment decisions. Whenever capital assets reach the end of their productive lives, they should be replaced with energy efficient and low-carbon alternatives wherever possible and prudent. All businesses, especially those making regular long-term, place-based infrastructure and supply chain investments, should also conduct detailed analyses of climate risks they face, build internal capacity, develop concrete action plans to address these risks, and disclose their risks and actions. The transition to a clean energy economy is already underway, but must be accelerated to avoid unacceptable risks from climate change. In the past, transformative investments in such areas as highways, rural electricity, and telecommunications have unleashed the power of innovation and American business. Investing in clean energy can ensure American economic security and competitiveness for decades to come. But to substantially reduce the growing risks of climate change, and to take maximum advantage of the opportunities in a clean energy economy, we must act now. James W. Owens, Former Chairman and CEO, Caterpillar Inc. Rob Walton, Retired Chairman of the Board of Directors of Walmart Stores, Inc.
Research: Risky Business Project Co-Chairs Michael R. Bloomberg, Henry Paulson, and Tom Steyer tasked the World Resources Institute, a global research organization, with an independent assessment of the economic opportunities in a transition to a clean energy economy in the United States. The research team was led by WRI Senior Fellow Karl Hausker. WRI partnered with Evolved Energy Research in modeling pathways to a clean energy economy, working with Ben Haley, Ryan Jones, and Gabe Kwok as principal analysts alongside Jim Williams, Director of the Deep Decarbonization Pathways Project. The team’s complete assessment, along with technical appendices, is available on the Risky Business website, riskybusiness.org. In addition, Elaine Beebe provided editorial assistance; Joanna Feng provided research assistance; and Candice Allouch, Megan Kaiko, and Marcela Miceli provided project coordination. The research team’s work was reviewed by an independent Risky Business Expert Review Panel composed of leading climate scientists and economists. A full list of the expert review panel is available below. Report Design & Layout: Richard James Herring, Aires Almeida: HabitatSeven Inc., habitatseven.com. Funding: This report would not have been possible without the financial support of Bloomberg Philanthropies, the Paulson Institute, and TomKat Foundation. This report is a product of the Risky Business Project, produced in collaboration with WRI. Suggested Citation: Risky Business Project, From Risk to Return: Investing in a Clean Energy Economy, 2016. Expert review of the report is provided by: Dallas Burtraw, Senior Fellow, Resources for the Future; Stephen Doig, Managing Director, Rocky Mountain Institute (RMI); Peter Fox-Penner, Director, Institute for Sustainable Energy, Boston University; Jeffery Greenblatt, Staff Scientist, Lawrence Berkley National Laboratory (LBNL); Etan Gumerman, Senior Policy Associate, Nicholas Institute, Duke University; Hal Harvey, Chief Executive Officer, Energy Innovation; Doug Holtz-Eakin, President, American Action Forum; Larry Linden, Founder and Trustee of the Linden Trust for Conservation. Additional expert review provided by WRI staff: Helen Mountford, Kevin Kennedy, Alex Perera, Laura Malaguzzi Valeri, Noah Kaufman, Juan Carlos Altamira, and Michael Westphal.